Today we started getting our new office ready for our big move in a few weeks time. So it was all systems go, and I met two of the workmen there at 0830 in the morning as we were having new outside doors fitted, and new phone points being put in throughout the office. We allowed for 16 telephone points which should be enough. Enough to allow for any expansion in the future, our current system can handle the calls and in a year’s time we can upgrade to a newer system if need be. We have had the carpet fitter in to measure up and price the fitting of new carpets, to our training room and reception area. In the afternoon we are had the graphics company in to measure up for fitment of window and over the office sign, and training centre sign. So for the first day there was lots of activity and already the office is looking a whole lot better. The doors made a huge difference and now the building is secure as the old doors weren’t up to much and could have easily been opened. My wife Catherine found a new desk that she liked online and arranged for it to be delivered the next day. It’s a very nice desk and it’s a lot bigger than mine! A very nice sophisticated arched desk that will really look good in our new office together – we are creating our own MDs office – so we can have everything to hand. The only priority for me is to have a decent PC or should I say Mac, as that it what I now use for 95% of the time, so my Mac is going to look very good on my desk. So in all a very eventful day. The doors looked fabulous and there was lots of new trunking running down the walls ready for the rest of the phone system to be installed. AGA Certified Engineer Qualification Fact or Fiction? Certified Engineer to keep their AGA Care cover intact and not to invalidate it. As they were referring to replacing the chrome dome on their Deluxe AGA it seems odd to me that you would need to have done any sort of course with AGA Rangemaster to be able to do this when it is relatively straight forward, and I don’t think taking apart a lid would be something they would have covered in any sort of training anyway, and certainly no certification scheme. If I wanted to call myself an AGA Certified Engineer how would I go about getting this accolade? I’m just doing some refurbishment of AGAs, replacing the lids, and seals all straight forward stuff. Surely you don’t need a certification? Is there really any certification I can get for this? I’m pretty sure it’s unlikely. I’ve checked the Terms and Conditions of The AGA Care Service and Repair Agreement and it doesn’t make an reference to cosmetic damage other than to say that it isn’t covered. It doesn’t mention AGA Certified Engineers. It doesn’t mention, at all, any work carried out on the AGA by anyone other than an AGA Engineer and if that invalidates the warranty. Though there is a clause that says AGA can terminate at any time if they want to, so I expect this is the issue if you upset them they won’t continue with the plan. Looking at the AGA Care Plan though it really does look like a good plan and for our 30 Amp AGA it would work really well as last year it cost us close to £400 to get it repaired when it went wrong (three elements and new fan) and the monthly payments for our cooker with the plan would be about £15 a month. Looking through the list of courses that AGA run at The AGA Training Centre there is no mention of any sort of certification scheme that can be completed or any certification that can be passed so its all a puzzle to me. There are OFTEC qualifications and Gas Safe certifications but these are not ‘AGA certifications’ and as far as I can see if you wanted to specialise in just servicing electric AGAs all you need to do to become ‘AGA trained at Telford’ is to go on their 2 day Electric AGA course. Would this mean I’d also be an AGA Certified Engineer too? There doesn’t seem to be any sort of courses for dismantling or putting together an AGA, but as I understand it if you are employed by AGA then you’d would go through this in your training. So this maybe the AGA Certified Engineer Qualification; you have been employed or are employed by AGA and have gone through their employed engineer training. The courses at The AGA Training Centre are open to anyone who wants to service AGA cookers and you can just choose the course you want to go on, pay the course fee, and then off you go. From what I can see the OFTEC one would be relatively straight forward to obtain for me, you don’t need the gas experience over a number of years and it just depends on your background, but really I don’t want it as I have an AGA cleaning company! I have done a search on the internet and found four companies who say they have AGA certified engineers and I have emailed them, so hopefully all will become clear. And I will speak to the AGA training centre in Telford to see what sort of courses they run for dismantling etc, but I don’t think they do. 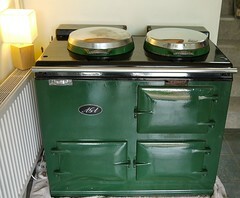 I rang up my local AGA dealer (Spillers of Chard) who I have been using for the last 14 years and they said that their engineers were trained at Telford which could mean anything from the 2 day electric AGA course to a few weeks training if they have gone for all the other courses. And when searching I found that some companies in the USA where ‘Certified AGA Engineer Companies’. But in all I think that AGA Certified Engineers is a made up term and really they are Certified Engineers, either OFTEC or Gas Safe, that work on AGAs, and have been on one of the courses at The AGA Training Centre in Telford. But I could be wrong watch out for my update… they may all have an AGA Certified Engineer Qualification on their walls! In my role of dealing with complaints this week I have gone and seen somebody about scratches on the glass of their main oven door after we had cleaned it. This is the first time that anyone as ever complained about this so I was interested to see what the problem was. We cleaned it last week and the lady said that afterwards when the afternoon Sun was shining through the window you could see that the glass was scratched. So this can mean that as the oven had been cleaned the Sun shining on it highlights the scratches that were there before and as they are now clean they become very obvious. Glass on oven doors does get scratched by use over a period of time and some of the older ovens I have cleaned and been really scratched badly. But this lady told me that the oven, AEG Competence, was only a year old and she had never cleaned it herself so it had to be us. I had a look at it and it was definitely scratched, I agreed to replace it with a new one and I ordered it when I got back to the office. Interestingly the price on Espares was about £100 more than the price from AEG directly. I spoke to the operative and he told me that he had used a steel scourer on it and this is what must of scratched it. We don’t normally use the steel scourer and our normal process would have been to take the glass out of the door and dip it in the tank in the van but he told me that as the door ‘wasn’t that dirty’ he had use a cloth and then used the steel scourer to pick off some of the stubborn bits. So we learnt something from this, I know that on newer glass doors, if the glass comes out as a unit, I tend to to treat them as ‘eggs’ and just dip them in the tank and then dry them off and that is it a perfectly clean glass without using anything else. I told our employees in our meeting that afternoon to be careful with these types of doors especially if the door is reasonably new, so hopefully we won’t get any more of these. In my last post I mentioned that we are moving offices. We aren’t moving far it is a matter of 100 yards but the move will be a big move forward for us as a business. ‘Why are we moving?’ you might ask, as if you have seen our current operation you might ask – isn’t that enough? – but it has been pretty obvious recently to us that our current premises are too small. As we have recently taken on a new member of staff – Charlotte Hardy – and also have had a university student – Jack Robinson – for the a lot of the past few weeks we haven’t had anywhere to sit! We (myself and my wife Catherine) have both been working at home and it hasn’t been ideal. So something is telling us it is time to move. With the new premises we will have the capacity to increase our ‘call centre’ staff to 10 which we think will be the number we will need to be a national as a company with local franchisees covering the local areas. It means that we will be able to handle the franchisees calls in the most professional way. Also the new premises will have quite a large training room where I will also to do some video shooting, so a sizeable room where we can set up rows of chairs and do some proper training and presentations. And we will have our own office to work independently from everyone else. Also it will have a training kitchen which is going to be bigger than our current one. So for us it is an exciting time, I am currently pricing up kitchen bits and pieces to kit out our new training kitchen, and working out how we are going to move our AGA cooker and other cookers into it; and for the main office we are sorting out new phone lines and a new computer system. We hope to all in and operating out of the new premises by the third week in September. This is a video of my wife Catherine, so Catherine Rogers, at the Business Wealth Club Meeting this week in Oxford. This is the second time she has done this and got an applause for it so she will be looking for a third one next time. I was there two and filmed it on Catherine’s phone, hence the poor quality production but I have fixed the sound in my video editing software. We tend to take it in turns to go to The Oxford Business Wealth Club, we have been going there for over a year now. As we leave Bristol at 0515 to get there for the start of the meeting at about 0730 am. The best way to describe The Business Wealth club would be: it is a business networking club with training. So there are about 40 local business owners who regularly attend, we tend to discuss a business question over breakfast and then get some training from Paul Avins and then we have to do the 30 to 45sec slot on your business. I am getting better at these but Catherine has changed gear recently and has really tuned in to getting the message right. Last Year we (OvenGleamers) won The Business Wealth Club award for ‘The Fast Start Business Of The Year’ for the amount of changes we made to our business between May and December of 2012. This year we are still accelerating and are just about to move to new office premises – watch out for my next post – which will put us in the best position for growth.